†Lucien Deiss, CSSp, (1921–2007) was a pastor, liturgist, author, lecturer, Scripture scholar and composer. Best known to Roman Catholics in the United States for his scriptural songs, “All the Earth” and “Keep in Mind,” Father Deiss was also widely known in Europe and the United States as a scholar in the fields of Sacred Scripture and Patristics. 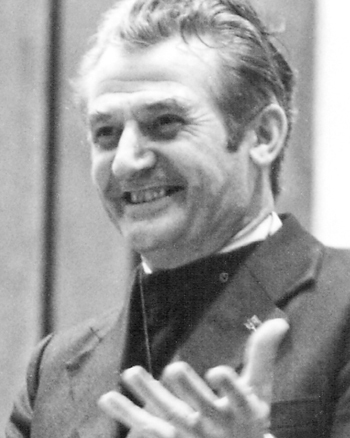 A native of France and resident of the Seminaire des Missiones in Larue, France, Spiritan Father †Lucien Deiss (1921–2007) was heavily involved in the liturgical reform of the Lectionary during Vatican II and was a member of the Concilium on Liturgy. He was a specialist in biblical exegesis and he formerly occupied the Chair of Sacred Scripture and Dogmatic Theology at the Grand Scholasticat des Peres du Saint-Esprit in Paris. He served as a member of the Committee for the French Ecumenical Bible and was formerly liturgical editor of the magazine Assemblee Novelle. As a missionary priest, he gave retreats and worked with the poor in several nations of the world, including Africa, Haiti and Taiwan, for many years. Best known to Roman Catholics in the United States for his scriptural songs, “All the Earth” and “Keep in Mind,” Father Lucien wrote hundreds of liturgical songs and hymns. Father Deiss passed away on October 9, 2007 at age 86.